Priced Separately -- MUST SELL -- Make me an Offer -- For ANY -- OR Multiple Items -- OR ALL !! Buyer to pay U.S. Shipping, or items can be picked up. Cash or Money Order Only. Christmas Miniatures for Dollhouses, Fairy Gardens & More ! Great for Train Set Ups too !! Ask for Details !! Happy to email more pics of items not showing OR any items -- just ask ! $14.00 - Lundby, No. 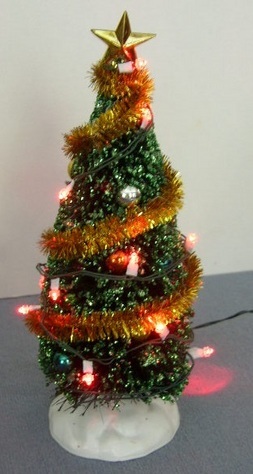 8981, 1:16 Scale, Decorated, Plastic Christmas Tree - Decorated with Christmas Balls & Candles & a Silver Star. Has an attached White & Blue, & Red Heart Design Tree Skirt. Measures 5-1/2 x 3 inches. $ 9.00 - Heavy, Cast iron Mailbox on Post with Base. Has Box Latch, with "MAIL" on one side & Black & Red Flag on other. Measures 2-5/8 x 1-1/4 x 5/8 inch. - 4 Christmas Wreaths - 2 Made of Snow Covered, Bottle-Brush, Bristly, Faux Pine Fir with Red Ribbon & Gold, String hanger. Each measures 2-3/8 x 3/4 inch. 1 Made of Paper, Faux Pine Fir, wrapped in Gold, Ball Garland, with 2 Gold, Metal Bells & Gold String hanger. 1 Made of Shimmering, Red, Faux Pine Fir with Red Bow & Gold, String hanger. Measures 7/8 x 1/4 inch. - Decorative, Arched-Gate & Fence & Brick Entryway, with Snow Covered Ground & Bottle-Brush, Bristly, Faux Pine Fir Trees & Bushes. Arched-Gate & Fence made of heavy, Resin. Measures 3-3/4 x 5-3/4 x 2 inches. - 3-Piece, White, Picket Fence, 1 Piece with Attached Mailbox - Decorated with Shimmering Green Garland & Red & Gold Bows (1 missing ribbon). Piece with Mailbox measures 2-1/8 x 6-3/4 x 1-1/8 inches. 2 Pieces measure 1-5/8 x 1 inch. - Christmas Decor -- Boxed Set of 6 Christmas Ball Ornaments (not removable), Lid Opens. Measures 1-1/8 x 7/8 inch. 8 Red & White, Candy Canes - Claymation Creation. Various measurements to 1 inch. Season's Greeting Sign - Claymation Creation with 3 Legs & Ball Feet. Measures 1-1/8 x 1 inch. 1 Red Resin Wrapped Present with Green Bow. See More Dollhouse items & All my items posted for sale in my online store !